Grace has been singing along side her father in church for years. Now, at eighteen, she is ready to make it big and prove she can do it herself. She takes out on her own to Los Angeles and life gets tough. As her music and popularity grow, her relationship with God and her parents diminish. Grace is given a book, Own It, that challenges her faith. With this great devotional to aid her and the prayers of many, will Grace get back on track? Grace Unplugged is an incredible story. It gave not only entertainment, but great inspiration and encouragement to me, and to my teenage daughter. Own It is an incredible devotional that I cannot wait to read again and pass on. 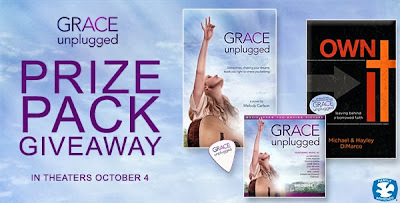 Grace Unplugged, the movie, came to theaters yesterday. As someone who loves faith and family films, I cannot wait to see it! And a big bonus, Jamie Grace is in the movie! Our family just loves her! My daughter and I truly love this book and are beyond excited for the movie. And as for the Own It book, this is something very personal to my family. My husband has been talking a lot about ownership lately. Encouraging our kids to take ownership of our home and the things in it (aka: doing their chores) and talking to our church about ownership. I told him of this book and he is actually reading it! My husband never reads. Never. Great list! Thanks for stopping by Julia! I pray that I get to win. Inez, great list. Thanks for stopping by! Love your list! Thanks for stopping by Laura! The fact that I am a follower of Jesus! !